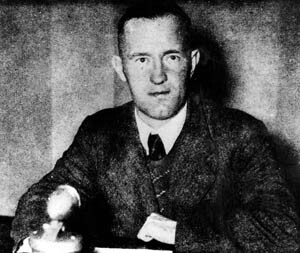 American-born Nazi radio propagandist William Joyce amused, and also terrorized, British listeners. The most famous of the English-Language radio broadcasters from Nazi Germany was Brooklyn, New York-born William Joyce, known by the disparaging moniker Lord Haw Haw. Joyce became the most popular broad- caster on the “Germany Calling” propaganda radio program broadcast to a large audience in Great Britain from inside the Third Reich. Joyce assisted the Nazis throughout the war in their attempt to undermine British morale in the hope of forcing the country’s surrender. Although Joyce was not the only English-speaking propagandist on the program, he took it to new heights of popularity during the Blitz, the Luftwaffe’s aerial offensive against civilian and industrial targets in Great Britain from September 1940 to May 1941. The broadcast Barrington heard may not have been Joyce, but instead Sandhurst educated British Army officer and Nazi sympathizer Norman Baillie-Stewart, who moved to Austria in 1937 and became a propaganda broadcaster for the “Germany Calling!” pro- gram in July 1939. Baillie-Stewart’s voice was far more authentically pompous than Joyce’s American nasal twang. Barrington subsequently bestowed the nickname on the more popular Joyce, calling him Lord Haw Haw of Zeesen, which was the site of the English transmitter in the Third Reich. Approximately 60 percent of the BBC’s audience reportedly tuned in to his informative and humorous programs immediately following top news. They did so in part because they enjoyed Joyce’s over-the-top, sneering verbal assaults on the arrogant British establishment, and also because they badly wanted to hear what was happening elsewhere. In 1940, it was estimated that Lord Haw Haw had six million regular lis- teners and as many as 18 million occasional listeners. Although listening was discouraged in Great Britain, it was not illegal. From Joyce’s broadcasts, listeners learned of an alleged pro-German fifth column throughout the United Kingdom. They were frequently astonished by his eerily accurate pre- dictions and his knowledge of minute details of British life. Over time, British listeners came to hate him when it became clear that his aim was to terrorize the English people. Joyce was later ridiculed for being a puny figure, but he was of average height and build and excelled in boxing, swimming, and fencing. Because of his youth, Joyce missed serving in the British Army during World War I, but he later claimed to have aided the Royal Irish Constabulary Special Reserve, more commonly known as the Black and Tans, which the British government deployed to suppress Irish nationalism. He opposed the Irish Republican Army. In 1921, at the age of 16, Joyce became an Irish Republican Army target, but the plot to assassinate him miscarried. His parents had both their home and business attacked by Irish Sinn Fein nationalists, who threatened they would slit his tongue if young Joyce continued informing on them. The Joyces relocated to England in 1921 for safety, and Joyce applied for admittance into the London Officers’ Training Corps. Joyce resumed his studies as a foreign exchange student and lied about his age when he enlisted in the British Army. When Army officials discovered he had lied, he was discharged. By 1923, he was a student of English language, literature, and history at Birbeck College. He became involved with the British Fascisti, which was founded by Rotha Lintorn-Orman. He gained a reputation as a fiery speaker and combative opponent when heckled. British Lieutenant Geoffrey Perry shot Joyce. By 1924 Joyce commanded his own Fascisti combat squad. He became embroiled in a violent fracas with left-wing opponents at a Conservative Party rally during which he alleged he was attacked by Jewish Communists, who slashed the right side of his face with a razor blade. The severe cut ran across his right cheek from behind the earlobe to the corner of his mouth and required 26 stitches. Joyce left the British Fascisti in 1925 for the Conservative Party. Six years later he left that political party, too. In June 1934, Mosley named him as the organization’s propaganda director and later as deputy leader of the movement. Joyce was always “the first to dive into a fracas with knuckle duster at the ready,” said one eyewitness. Opponents at British Union of Fascists events rose from a dozen to thousands, especially as Joyce’s anti-Jewish rhetoric grew ever shriller. Joyce loved being perched on a soap- box outfitted in a fascist black shirt, buttoned dark suit, and high-necked pullover, with his right hand gripping the microphone. Joyce became a leading spokesman against the British cabinet’s Government of India Act of 1935, which passed despite opposition. Joyce’s violent speeches and tilting toward the British Union of Fascists ever more anti- Semitic rhetoric soon began alienating both the British voting public and Mosley. Nevertheless, Joyce persuaded Mosley to rename the party in 1936 as the British Union of Fascists and National Socialists, thus aping Hitler, Joyce’s ideological hero. In 1937, Joyce ran as a British Union of Fas- cists candidate for an elected seat on the London County Council, but he lost. Badly defeated in the April 1937 elections, the British Union of Fascists lost membership and contributions. Mosley dropped anti-Jewish rhetoric in favor of preventing another Anglo-German war. The schism between Mosley and Joyce was also based on their different personalities. Mosley was charming, humorous, and outgoing, while Joyce was hot tempered, intense, and impatient. Their break came when Mosley pared down the organization’s paid staff from 143 to 30. Joyce was among those who were laid off. Joyce took with him 60 former members of the British Union of Fascists to launch his National Socialist League. Joyce’s second wife, Margaret Cairns White, served as the organization’s treasurer. The league had little influence, and it was soon down to 20 members. Joyce argued against numerous personal assault charges in court between 1937 and 1939 and was acquitted of all of them. MI5 of the British Secret Service put Joyce under surveillance beginning in July 1939 for being in contact with German agents in Britain. Once Great Britain was at war with Nazi Germany, Joyce was placed on an arrest list. In an effort to avoid arrest, Joyce disbanded the National Socialist League. He also renewed his British passport. Joyce lied when applying for his first British passport by falsely stating that he was a British subject when he was still legally a U.S. citizen. Tipped off by an MI5 profascist informant that they were about to be arrested, Joyce and his wife left Britain on August 26, 1939, one week before England declared war on Germany. Upon arriving in Berlin, Joyce met German Foreign Minister Joachim von Ribbentrop’s private secretary, Erich Hetzler. The Nazis immediately put him to work. Joyce was given the dual job of editor and speaker for all German foreign language radio broadcasting. As such, he was supervised by the staff of the radio department of the Propaganda Ministry headed by Minister of Public Enlightenment and Pro-paganda Joseph Goebbels. Joyce was known as Lord Haw-Haw. Initially, Joyce was not well received in Berlin. Some Nazis suspected that he was an MI5 double agent. A dejected Joyce rushed to the British embassy to return home even if that meant internment for the duration of the war, but it was too late. Joyce would have to survive in the Third Reich to the best of his ability. Joyce subsequently flubbed his radio audition, but a studio sound engineer believed that he showed promise. Thus, by default was born the star of German airwave propaganda against Great Britain. Joyce made his first broadcast on September 11, 1939, as an anonymous speaker. He defied established rules by writing his own scripts. Joyce’s programming was a smash hit with his British target audience. Joyce’s odd accent accounted for most of the unintended derision against him. London comedians regularly parodied him, and he was even featured in BBC radio advertising, although at the time no one knew his identity. At first everyone laughed at the mysterious announcer’s pretentiousness. After France fell in June 1940, and there was a very real threat of a cross-Channel invasion of the British Isles, officials at the Home Office in London took a more serious interest in the shows, particularly as the broadcaster assumed an all-knowing aura of authority and accuracy. Joyce was credited with knowing minute, precise details about what the British government was doing. To the amazement of his listeners, Joyce correctly predicted what targets would be bombed and the results of the bomb strikes. By reading official Luftwaffe reports that were not released in England, he was able to scoop BBC reports. In addition, Joyce read day-old London newspapers, selectively monitored foreign news- casts, and featured speakers from prisoner of war camps inside German-occupied Europe. As the devastation from aerial bombing worsened, though, his popularity sagged. Joyce and Margaret became German citizens on September 26, 1940, and his reach expanded with script writing for a trio of black radio pro-paganda stations: Radio Caledonia, Workers’ Challenge, and the New British Broadcasting Service. He also recruited British POWs to enlist in the British Free Corps unit of the Waffen SS, and he published a book, Twilight Over England, in which he contrasted the ideal Nazi Germany versus the Jewish-dominated, capitalist enemy state. Joyce photographed in an ambulance after his wounding and capture. He received the death sentence for his treason, and a conspiracy theory held that he was a double agent. With the war lost, Margaret turned to opium, and both drank heavily and had numerous extramarital affairs. Joyce asked himself rhetorically in a diary entry of April 22, 1945, “Has it all been worthwhile? I think not. National Socialism is a fine cause, but most of the Germans, not all, are bloody fools.” On May 1, 1945, the British Army took Hamburg, causing the Joyces to flee northward to Flensburg in Schleswig-Holstein. Behind them, Joyce’s personal microphone was captured and used on air to mock the fugitive Lord Haw Haw and Lady Haw Haw. A pair of British Army intelligence officers stumbled upon Joyce on May 28, 1945. When Joyce greeted them, the officers immediately recognized his distinctive voice. They asked him point blank if he were Lord Haw Haw. As Joyce reached into a pocket for a false passport that identified him as Wilhelm Hansen, Lieutenant Geoffrey Perry, a German Jew, suspected Joyce might be reaching for a pistol and shot him in the leg. 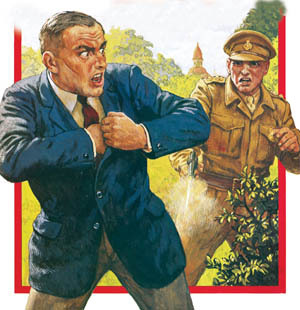 His captors turned over Joyce, who was unarmed, to Royal Military Police later that day. After spending a fortnight recuperating at the British Military Hospital in Luneburg, Joyce was flown back to the United Kingdom on June 16, 1945, under heavy guard. The irony of his arrest was noted in one account. “The soldier who shot the infamous broadcaster … had been born a German Jew … arrived in England to escape Hitler … became English, and arrested an Irish-American who pretended to be English, but had become German,” stated the account. His three-day trial at London’s Old Bailey began on September 17, 1945. Attorney Gen- eral Sir Hartley Shawcross indicted him on three counts of treason against the Crown while residing in Germany at first on a British passport and then upon becoming a German citizen during wartime after his passport expired on July 7, 1940. The court convicted Joyce on one count only, but it carried the death penalty, and on September 19, 1945, he was sentenced to hang. A large segment of the population felt that Joyce had been railroaded, and even Shawcross admitted that he was not proud of the case. Noted British historian A.J.P. Taylor added waspishly that a noose was being placed around Joyce’s neck for making a false statement on a passport, for which normally he would be fined but two pounds. On January 3, 1946, hangman Albert Pierrepoint carried out the death sentence on 39-year-old William Joyce at London’s Wandsworth Prison. He was buried that night within the prison walls in an unmarked grave at night. In 1976, Joyce’s body was exhumed and taken to Ireland where it was reburied. Tags Adolf Hitler, Ambulance, American, army, assassin, Austria, BBC, Berlin, Boxing, Britain, British, British Army, British Empire, broadcast, CIA, cod, England, Europe, Fascism, fascist, France, German, Germany, Great Britain, hitler, india, Irish Republican Army, Jesuit, Joachim von Ribbentrop, lance, london, Lord Haw-Haw, luftwaffe, MI5, military, military police, Monitor, Nationalists, Nazi, Nazi Germany, New York, OSS, pagan, POW, POWs, propaganda, radio, Ramming, Republican Army, Roman, SAS, Squad, Tern, Third Reich, Thor, Tory, Union, william joyce, WIN, World War I.